Life is all about accessibility to essential and desired facilities, services, information and goods. To support and sustain life, movement and accessibility to the public buildings that house them become vital. The quality of living depends greatly upon how accommodating and user friendly the public buildings and places you visit are in day-to-day life. It is the way others built the environment that has the potential to make or break your precious life or the life of your loved ones. 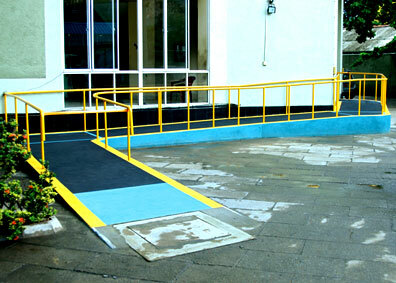 As such ‘Effective Implementation of Accessibility’ is an investment that would reward a growing and wide range of people and Sri Lanka enormously. Mobility is a passing asset that can be snatched away from anyone of us, at any time of life. You are no exception, irrespective of your position, power or possessions. For different reasons, over 18% of our population, i.e. as many as 3.5 Million - the largest minority group - experience a significant level of impairment of a temporary or permanent and of a visible or hidden nature, often limiting their mobility. As life progresses, impairments become inevitable. We could all suddenly find ourselves incapacitated and in need of buildings that are a joy rather than a trial to use. This is going to be increasingly likely as soon 20 per cent of Sri Lanka’s population will be seniors. ‘Man-created’ physical and architectural barriers along with prejudiced and negative attitudes, inhibit people’s full and active participation in society, waste productive potential and often force people to live on the margins of society - grave social tragedy indeed! As these are external factors, they are correctable. Society therefore has the ability and moral duty to reverse this ‘created’ tragic trend and make environments that will ‘Enable Everyone’. That’s not an act of charity, but an act of justice. ‘Constructing Accessible Facilities is costly’, is a total misconception. It is not an added financial burden. Especially with new buildings, it adds less than 3 per cent to construction costs. Investing in projects making facilities user-friendly will empower people to become more independent integrated productive citizens, with a better quality of life than before - and more inclined to use your services. ‘Equal Opportunity’ should be the basis for more meaningful corporate social responsibility work. ‘Designing for Inclusion’ is a highly responsible professional job. Unless backed by a good understanding of its intricacies and practical experience, attempted implementation of internationally accepted regulations run high risks of failure, wasting money, time and effort. As such, authorities undertaking constructions certainly need expert guidance from those with proven competence, as to how best to do this correctly. Idiriya, a registered group of Professionals who continue to be exceptionally responsive towards this crucial subject, have embarked here on a not-for-profit mission of National importance. Large and increasing numbers of patriotic disabled service personnel have sacrificed limbs and eyes in battling round the clock to protect all of us and save Mother Lanka. Yet, their access to the opportunities their peers have, is limited by the fact that they either move on wheelchairs or with crutches! Even these precious personnel are marginalised and made unwanted dependants by our ‘disabling’ constructions! What have you done about it? The Constitution of Sri Lanka recognises seven criteria, such as race, religion, caste under Clauses 12. (1) & 12.3 entitled ‘Right to Equality’ on which grounds, it specifies, no citizen shall be discriminated or restricted against. ‘Dis-abilities that debilitate persons from attending to day-to-day activities’, discriminate or restrict or marginalise far greater number of people than any of these seven criteria. I propose: this crucial fact should be included as the eighth criterion to our Constitution. It would be a morale boosting timely action by the State, at least for the sake of our ‘patriotic war heroes’, if ‘right’ measures are enforced without any further delay, to arrest ‘Man constructing further physical barriers to man’. One of the first things Barack Obama has already done is ‘setting in motion’ a four-part plan to provide ‘Disabled Americans’ with the greatest possible access to the same opportunities as others. That’s the vision of a true leader. May this be a good eye opener to us also. Let’s resolve: ‘Make certain that nobody is disadvantaged with the money you invest on construction’. It’s now or never !! The Writer - a Wheelchair user - is a voluntary disability activist, a pioneering campaigner and a consultant on ‘Enabling Environments’.